Our venue combines architectural beauty with modern facilities, offering big spaces and plenty of breakout rooms to accommodate your exhibition. Combined, our four largest rooms offer over 1,100 square metres of flexible space, great for an exhibition venue. Our Assembly Hall can contain up to 48 poster panels on its own. We are situated in an attractive location, just a few minutes’ walk from Buckingham Palace, Big Ben, Westminster Abbey and the West End so your guests can make the most of their visit. We offer mouth-watering hot and cold buffets as well as a wide range of sophisticated canapés if you are planning to host a reception during your event. Church House Westminster is a conference centre in Central London holding over 800 events a year. Our flexible and versatile event spaces can hold a variety of events including exhibitions, meetings and conferences, AGMs, Christmas Parties, Product Launches and much more. Most of our event rooms offer first class audio-visuals and advice, breakout spaces, beautiful views and catering services are available. As one of the largest event rooms offering over 1,100 square metres of flexible event space at Church House Westminster, Assembly Hall offers a perfect exhibition space in Central London. It is one of the most memorable rooms in our conference centre because of its iconic style, beautiful West Abbey views and first-class audio-visual facilities. Built in 1939 our stunning Grade II Assembly Hall was designed by world-renowned architect Sir Herbert Baker. Natural light streams through the 15 arched windows onto the gallery level, but can be darkened if required. Steeped in history, our Hoare Memorial Hall has a stately atmosphere and played host to the House of Commons for a period during the Second World War. Modern and spacious, our Harvey Goodwin Suite is a self-contained room with all the latest facilities. Its large and secondary glazed windows allow for plenty of natural daylight, whilst keeping the room sound-proofed. An atmospheric blend of elegant stucco ceiling, traditional oak panelling and a stunning stone balcony with views of Dean’s Yarn and Westminster Abbey. 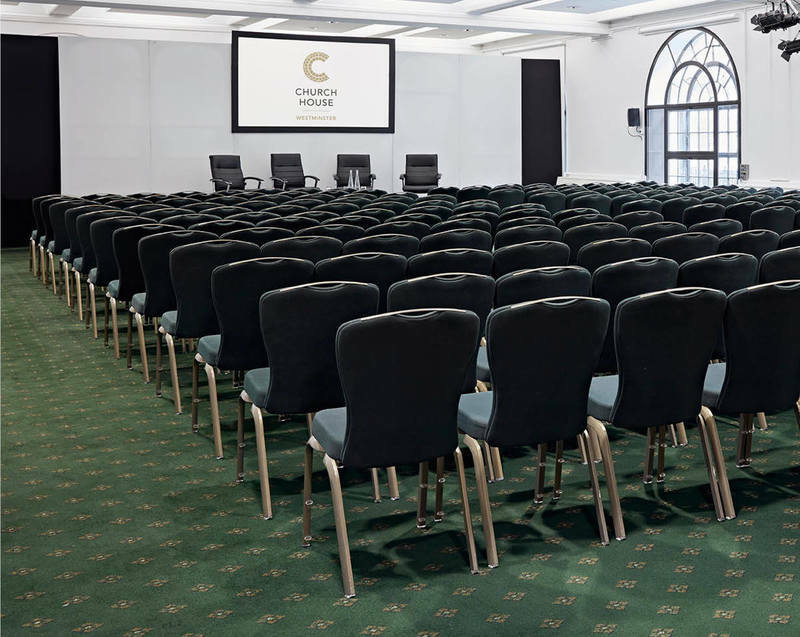 If you have any questions about our exhibition spaces to hire in our conference centre in Westminster, Central London, please fill in our contact form or call us on 020 7390 1590.